The Placa or Stradun, running from east to west, is the longest and most important street in the Old Town. It connects the Pile Gates (western entrance) and the Ploce Gates (eastern entrance) and is 292 metres in length. From both sides of the Stradun, narrow side-streets emerge, in which lie hidden a multitude of shops, cosy restaurants, café bars and souvenir shops. 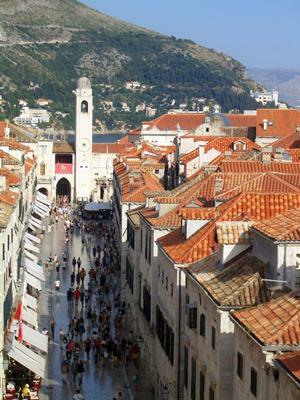 Stradun is the main artery of the Old Town and is always bustling with tourists and local inhabitants. The Great Onofrio's Fountain is at the western end of Stradun, named after the 15th century builder of the Dubrovnik water supply system. The city Bell Tower with a clock is on the eastern part of Stradun, erected in 1444 and standing 31 meters hight. In 1509, Ivan Rabljanin cast the bell and the famous zelenci (Maro and Baro), who strike the bell upon the hour. Orlando's Column stands in the centre of the square. It is a symbol of statehood, and a state flag flies from its mast, replaced by the patron sain't flag during the Feast of St. Blaise. The Libertas flag is raised during the Dubrovnik Summer Festival. The Sponza - a monumental Gothic - Renaissance palace, is situated on the other side of the square. During the time of the Republic, this was the location of the custom office, the state mint and state treasury. Today, Sponza harbors the most important cultural institution - the Dubrovnik State Archives, whose valuts keep many authentic documents on the thousand year history of the Dubrovnik Republic. The Sponza is also home to the Memorial Room of the Defenders of Dubrovnik in the Homeland War in 1991.